Jen Mirabile: Rockin Out at the Show! Rockin Out at the Show! I mentioned in a previous post that when Jared was working the YS Convention here in Nashville, Andon and I were able to hang out one of the days. We had so much fun hanging in the booth and walking around the show looking at all the fun stuff there. One booth was a company that does youth camps in Colorado so they had fake snow blowing out the whole time with a really neat outdoorsy backdrop. Andon brought me back to that booth four times to play in the snow. I guess he thought it was real. :) There was also live music playing just a few booths down from where we were which was so fun. Jared's company was having a contest running in their booth and the prize was the game Guitar Hero. 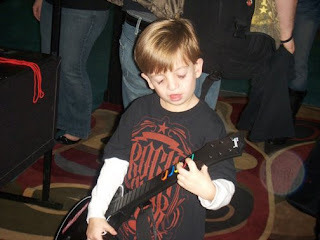 So in between all the people playing, Andon would grab the guitar and rock out a little. While he was playing Pam snapped this photo for me. Thanks, Pam! Look out Clint Black!! Haylee is getting a guitar for Christmas. She is convinced she will be the next Hannah Montana. Of course only if the guitar is pink! So cute! I love the shirt with the guitar. He looks like a rock star. I love the idea of guitar lessons! You Are So Nashville :-) I love it! yes, it IS from brandi's blog! i love her heart. but i don't really know her - i know her friend, jody. small, small world, huh? thanks for leaving a comment!